This 35mm film compact camera by Minolta was released in 1991. It has autofocus and several flash modes, but it would be of little interest if it weren't for the fact that it is a close cousin of the Leica Mini II. With a glass lens allegedly manufactured by Minolta and electronics by Matsushita to specifications demanded by Leitz/Leica, this camera was also marketed as the Panasonic C-625AF Super Mini. The lens is very sharp for such an unassuming little camera. A quartzdate (QD) model was also available. 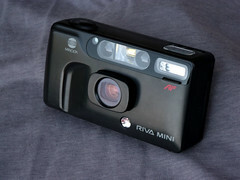 Also called the Minolta Riva AF-Mini in some markets, and Minolta Pico in Japan. Lens: 34mm, f/3.5 (four elements in three groups). The lens unit slides out when the camera is on but has no zoom capability. Lens cover features a built-in UV filter. Built-in flash features 5 modes, which you can cycle via a dedicated button: auto, auto with red-eye reduction, forced on, forced on with red-eye reduction, and off. Resets to the first mode (auto) whenever camera is turned off, but is remembered while it's on. Flash guide number 10 at ISO 100. Support for 50-3200 ISO, via automatic DX-code recognition. Albada type viewfinder with framing and parallax markers. Green multi-purpose LED is used to signal focus lock with proper exposure (steady), flash loading or subject too close (fast blink), or shutter speed under 1/30 (slow blink). Top LCD screen shows battery level, frame counter, flash mode and self-timer. Automatic film load, advance and rewind. Film mid-roll rewind button available. Focuses down to 22 inch (55cm) in 14 steps. Shutter speeds range from 1/5 to 1/350, plus Bulb mode up to 5s (in flash-off mode only). Power: one CR123A battery. Auto-power off after 5 minutes. Dimensions: 118x63x36.5mm with the lens collapsed, 42mm with lens extended. Weight: 150g empty, 210g loaded with 36-frame film and battery. Panasonic C-625AF Super Mini at 135compact.com.